Nao Kodaira claimed the women's overall title for the first time in two years at the ISU World Sprint Speed Skating Championships in Heereveen on Sunday. 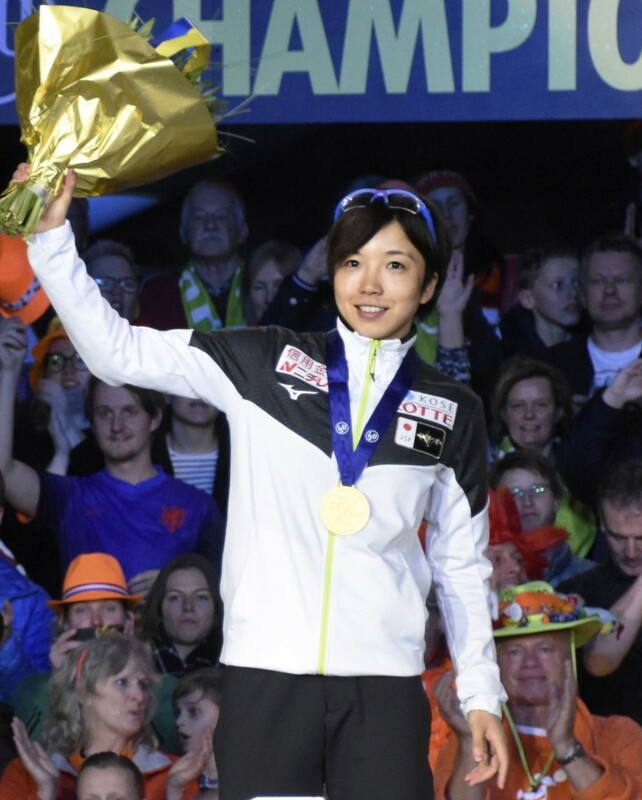 Kodaira, who pulled out of the competition before the last event last year due to illness, won the 500-meter race for the second straight day at the Thialf Ice Arena and came third in the 1,000 for a total of 149.665 points. "I'm proud of my results," said Kodaira, who spent two years training in the Netherlands and considers the Thialf rink her home ice. "It was my dream to be crowned champion on this rink. I'm genuinely happy. My goal is to become the world's fastest skater...I want to master the sport," she said. Kodaira lost her 500 crown to Austria's Vanessa Herzog at the world single distances championships in Inzell, Germany on Feb. 8, ending her 37-race unbeaten streak over the distance. But on Sunday, she said she regained her form, revealing that she had been struggling with a left hip joint injury. "I believed in myself (in all four races). This is as great as winning Olympic gold, if not more," she said. 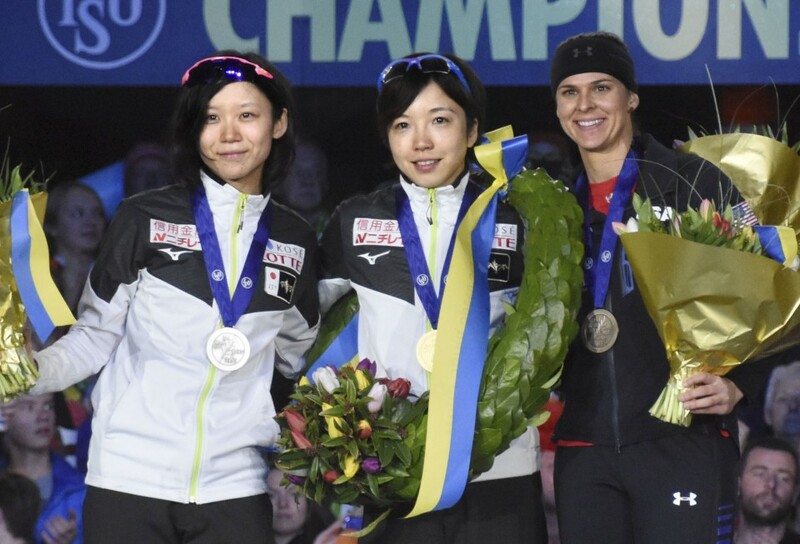 Her Japanese compatriot Miho Takagi, who won the 1,000 for her first gold in four races, finished runner-up in the women's overall, 0.39 points off Kodaira's winning score. In the women's 500 on Sunday, Kodaira clocked 37.41 seconds to finish 0.26 second ahead of American Brittany Bowe. In the 1,000, Takagi's winning time was 1:14.56, and she was followed by Bowe (1:14.64) and Kodaira (1:14.96). "This is a big effort for me, but I feel more regret (than satisfaction). It was a tough challenge but I thought I had a chance to win (the overall title). I wanted to put more pressure on (Kodaira)," Takagi said. Russia's Pavel Kulizhnikov earned the men's overall title and Japanese debutant Tatsuya Shinhama was second. Shinhama, who collected 137.805 points, is the first Japanese male skater in 10 years to secure a top-two spot in the annual two-day championships. Keiichiro Nagashima was the last man to accomplish the feat. The up-and-coming 22-year-old placed second and fifth in Sunday's 500 and 1,000 races, respectively. "I never imagined I would place second (overall) in my debut. It's been a while since a Japanese man medaled. I'm starting to feel that I have a chance in the (2022 Beijing) Olympics," Shinhama said. At the world sprint championships, two 500 and two 1,000 races are held, with the champion crowned based on the cumulative ranking.